At the July 3rd meeting, Fairview Town Council took several bold and unprecedented actions, most having to do with the increasingly complex challenges associated with the explosive growth of Fairview and Collin County in order to ensure that infrastructure keeps pace with growth. Coming in the wake of last November’s overwhelming bond election defeat, council members demonstrated a consistent and unwavering commitment to govern Fairview in a fiscally sound and businesslike fashion. Interestingly, discussion about the need for fiscal restraint to spare Fairview residents from increasingly burdensome taxes was repeatedly reiterated by Cynthia Brugge, Tony Mattei or Roland Feldman, all serving at the beginning of their first council member terms. This is not to suggest that other council members and Mayor Culbertson did not support fiscal restraint or lead similar discussions, they most emphatically did. It is important to know that on July 30, the council will meet in a daylong budget workshop to begin developing the town’s next fiscal year budget. Several residents spoke in support of the council’s expressed commitment to controlling costs and deferring tax rate increases whenever possible. Some praised individual council members for their vow to reducing expenses. Council member Tony Mattei was lavish in his praise of Fire Chief Bell and town staff who proposed the sale of a 14-year old fire truck for half of its original cost that would finance half the cost of a replacement apparatus. If this meeting were to have a theme it would be about smaller and less costly governance. Ironically, early in the meeting a proposal was presented for the purchase of video transmission equipment that would permit the streaming of council and board meetings at an initial cost of approximately $20,000 and annual maintenance fees of $9,000 thereafter. The same vendor has installed similar systems in Austin, Rockwall and Wylie. Lucas is currently considering its adoption. While several council members thought this would be a very worthwhile enhancement and provide obvious governance transparency, later in the meeting a member of the audience spoke against the idea questioning how many residents would actually use the service and whether it is really a necessary expense. There were many nodding heads in the audience. Fairview Fire Chief Jeff Bell lays out the timeline for the relocation of firefighters to a temporary modular facility by late- August. The most urgent matter before the council at this meeting was addressing ongoing concerns about the condition of Fire Station No. 1 on Greenville Avenue, a patchwork of old and dilapidated structures ripe with many life safety issues, electrical code violations, and living conditions detrimental to the welfare and morale of the town’s fire fighters. Concerns about the fire station have languished for several years until the council’s June meeting when it became obvious that extraordinary steps must be taken to resolve these challenges as soon as possible. It was noted that when Chief Bell was asked in 2016 if he wanted to relocate firefighters to an alternative location immediately he explained that doing so would hamper response time and could place residents in jeopardy. At that time, he chose to continue to occupy the deteriorating facility. 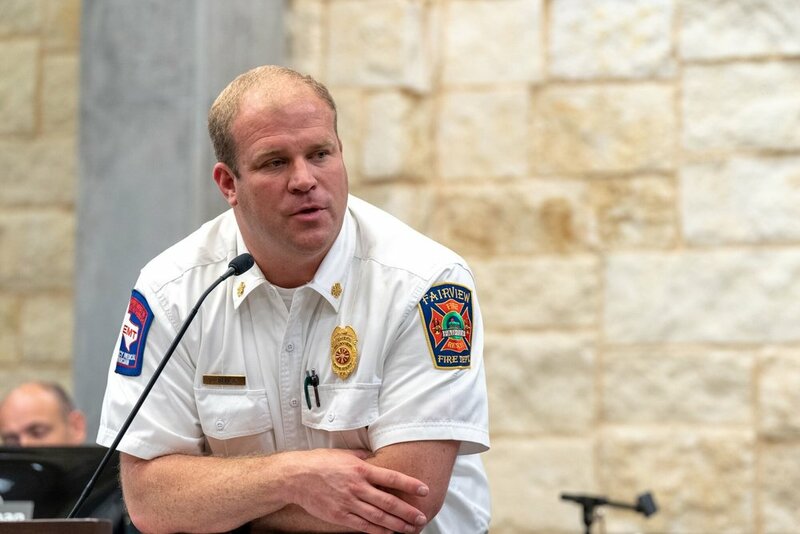 At the June meeting, Council charged town staff and Fire Chief Jeff Bell to develop options for the council’s consideration at its July meeting. Chief Bell and Town Manager Julie Couch presented two options, both clearly intended to be short term solutions until a way is found to fund and construct a new permanent fire station. After lengthy discussion the council elected the second less expensive option at a cost of $200,000 ($100,000 less than the alternative option) with an annual additional cost of $32,000. The proposal includes the leasing of a modular unit from Morgan Building Company that provides sleeping rooms, bathroom and shower facilities, a kitchen/dining area and day room. Included in the proposal that was adopted is the construction of a permanent sewer line beneath Greenville Avenue from the fire station property that would ultimately be connected to a new permanent fire station. The costs associated with the demolition and removal of the existing structure and the leasing of the temporary modular building will come from the town’s general fund reserve fund. The $80,000 sewer line construction cost will be paid for from the town’s Sewer Line-Utility fund. These expenses will not affect residents’ tax rates. Fire Chief Bell shared a project timeline with the council and anticipates that the new facilities will be occupied by mid to late August. Mayor Culbertson introduced a new idea as a way to partially fund the construction of a new permanent fire station much to the surprise and apparent delight of council members. Culbertson suggested that the council consider utilizing some of the funds contained in the town’s Community Development Fund (CDF). He added, “If a new bond is necessary for that construction, the CDF fund could help to mitigate the cost and potential impact on taxes. Similarly, water and sewer costs should pay for themselves.” In short, it is now clear that the search is on for alternative sources of revenue intended to avoid additional tax burdens on residents. Collin County Commissioner John Thomas informed the council of a November 2018 bond election that is necessary to plan and construct three new major non-tolled freeways; the Collin County Outer Loop, US 380 corridor and Southeast Collin County. It is urgent to move forward with each project because population growth in the county threatens to gridlock existing streets and thoroughfares on a daily basis. The Texas State Demographer’s analysis suggests the population of Collin County is likely to triple from the current 1,000,000 residents to 3,000,000 by 2045. Thomas explained, “Each of the freeways involves about twenty years of planning and construction. The bond package will cost $750,000; $600,000 for non-tolled freeways, $140,000 for thoroughfares and $10,000 for additional parks. Construction of the freeways is anticipated to begin in 2023”. “Additional bonds”, Thomas says, “Will be required about every five years until the projects are completed”. Complicating matters, the State of Texas has reduced its contribution for roadway construction from 16% to 4%." In yet another roadway matter, Craig James of CoServe reported that the relocation of gas lines along Stacy Road will be completed by mid-July at the latest. That unanticipated work was especially challenging he said, “Due to safety issues along the way as well as the necessity to drill through solid rock 14 feet below the roadway. Paving should resume by the end of July and all construction should be completed by early October barring significant rainfall”. Mayor Culbertson introduces Fairview resident Cadet 3rd Class Connor Spencer. He is attending the U.S. Air Force Academy. 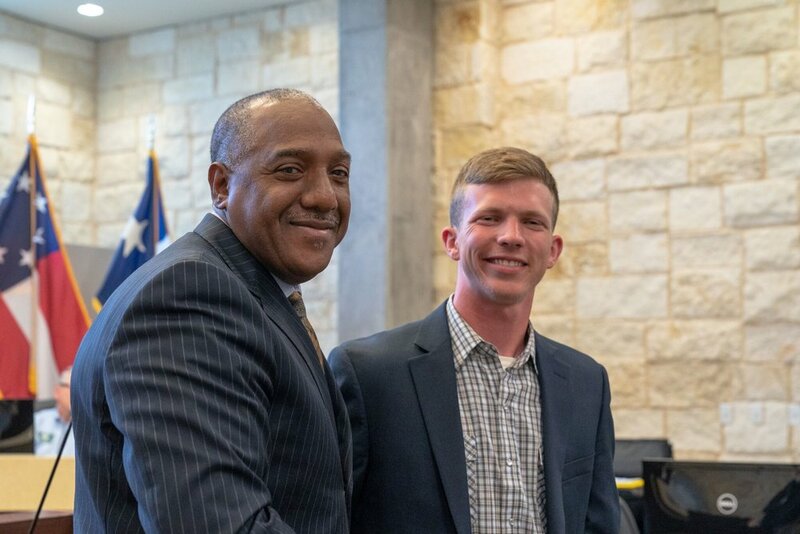 In what has become a Fairview Town Council tradition of recognizing outstanding Fairview youth, Mayor Culbertson introduced Fairview residents to Cadet 3rd Class Connor Spencer who is now attending the United States Air Force Academy. Spencer received an ovation for his service from council members and residents. The next Fairview Town Council meeting is scheduled for Tuesday, August 7, 2018 at Town Center in Fairview.